It is always quite an adventure to go to some backyards in Berlin. Whether it is a secret garden, a magic hideaway, a useful shortcut, playgrounds, a vegetable patch or an animal farm… you would be surprised. 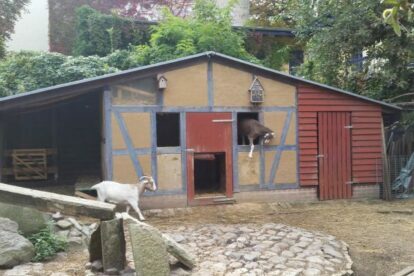 The Ziegenhof is a sustainable self-confident civic engagement community that involves neighbours and anyone interested in their support tasks, to take care of the animals, cleaning, while teaching everyone about sustainability, eco living, team work, mutual support, community life and animal and plant care. The purpose of the association is the promotion of environmental protection through education and training regarding the handling of plants and animals for people in densely populated inner-city areas, especially for children and young people. They have action days on which they gather to do some tasks and afterwards share a meal together, hold workshops and do other activities. But we’ve been there at times when they have no specific events and let the kids loose. They love seeing the animals, getting wild running around in the whole yard and playing in the playground. Note: it’s important to follow the guidelines and not feed the animals by yourself.